From childhood till current time, everyone must have visited at least one royal fort as a spectator. While moving through the palaces and forts, we always visualize what sort of splendid lifestyle royal legendary must have lived. How many times we wished to experience such a royal life of these heritages, dreaming of being a King or a Queen, this dream came true at Neemrana Fort Palace, Alwar. A perfect place for some memorable vintage living, where every section of palace is filled with royal culture and feel of kingship. We stayed in palace where kings and queens used to stay , you take any activity in the fort it looks and resembled us as like some king enjoying royal lifestyle of a kingdom. Complete fort is not in its old original form now,it has been renovated and reconstructed in a way to preserve and produce as for people’s accommodation. 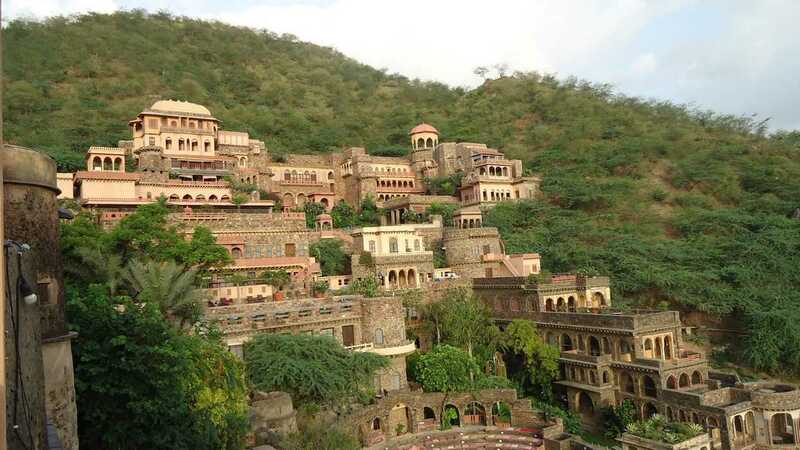 Best way to enjoy the full of Neemrana go as RESIDENT with your loved one (opting for a day or two day package ), whereas going going as a VISITOR is less privileged, where major of the fort in inaccessible. We visited there in the month of August from Delhi. Roads are very good and we experienced a smooth and a lesser tiring ride because short distance from Delhi. By the time we reached Neemrana city, we thought we must have reached a wrong place. It started with a local market and tidy streets. The palace was no where to be seen. We started google navigator and followed its direction, it led us to even tighter lanes. Again, we thought it has misguided us, but finally we saw the direction board towards the palace. It was a sigh of relief when we finally reached the fort. We had not expected something so peaceful amidst a small tidy city. We were given a nice and warm welcome by Neemrana staff. 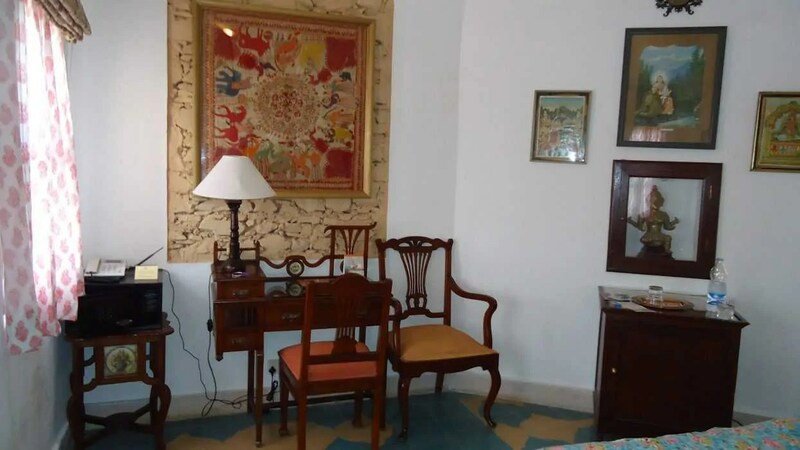 Before the booking, we have done a lot of internet search to find the best room in the Neemrana fort and finally settled for Gagan Mahal, since it was the highest Mahal. As Gagan Mahal(60000) was under renovation so got an upgrade to Parvati Mahal(Costing 12000). First bonus for us !!. Our first thought seeing the Mahal was that for this amount we could have got a luxurious room in some good hotel in city as the Mahal looked very ordinary. Since all the rooms in Neemrana Fort are of 17th-19th century, and we were actually living in royal heritage, the historical feel was worth the money. A very old wooden bed (but very well maintained one), metal statues, metal weapons at the door used by gatekeepers in history to guard to Mahal, gave us perfect illusion of being the royal rulers. In this Mahal, there was a very spacious balcony giving splendid beauty arch with utter peace and chirp of birds(very less in cities like delhi). At night, i.e. after 8 pm, we experienced a pin drop sort of silence everywhere. Neemrana Fort looked extremely beautiful with the lightning like festival of Diwali. Second day ,we stayed in Radha Mahal. It was also a beautiful secluded Mahal. But its location was not too good , gate of Mahal opens in veranda(Aangan) surrounded by other Mahals. To have fresh air or a good view, you have to walk up the stairs. There was a very small window to peep outside, but not an amazing view like Parvati Mahal. A ride in a vintage car at Neemrana : costing approx Rs 1200 for 5 kms. Walk in the Neemrana fort: There are many good places in the fort to sit and have a view from heights including a nice amphitheater. Book reading: Neemrana have a very good library where you may find some good books. Photography: Entire Neemrana fort is meant for photography, so don’t forget your camera. And most import is zip lining tours: Its cost is not included in the package, you have to take a separate package. You can have a breath taking views of the fort, hills and ridges as you fly down. Breakfast is generally included in the room cost and they serve a very good variety of food items. For lunch and dinner, you have to take a paid buffet, served in the most spacious Mahal named Jal Mahal. It would cost you around Rs 1300 per person, definitely a very costly deal. Also, there is fixed timing for lunch and dinner. So you will not find anything to eat at any odd timings and also there is no restaurant outside the fort also. We also looked for a cheaper alternative for buffet and find out that that there was a restaurant inside that also serves snacks if you don’t want to have dinner. 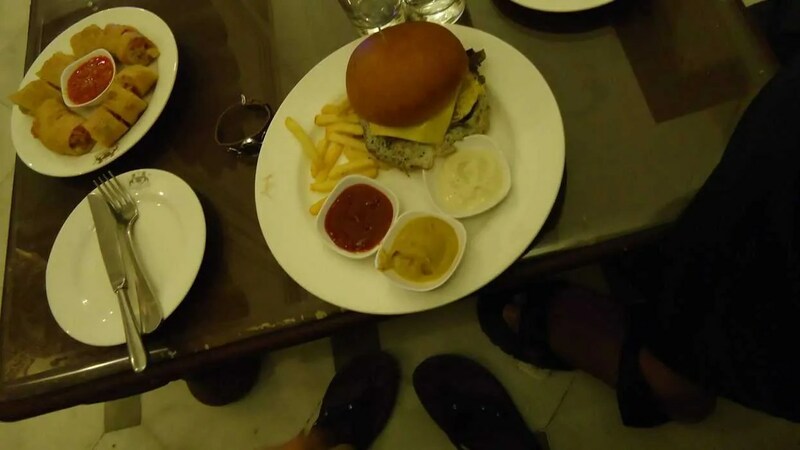 The menu was very limited and average cost of items was Rs 250- Rs 300, even for a sandwich. But the quantity looked sufficient and was able to satisfy our appetite. As another bonus to our stay at Neemrana, there was some shooting going on for a video song by singer Sidharth Mohan. They had to shoot a scene of a concert and for this they actually organized a musical concert for the residents. Amphitheater looked amazing with the lights and mashaals. It was an amazing show with really good music and lots of enjoyment. On second day of our stay at Neemrana, there was some confusion regarding the Mahal. We had two separate bookings for both day and the Mahal, we opted for was under renovation. 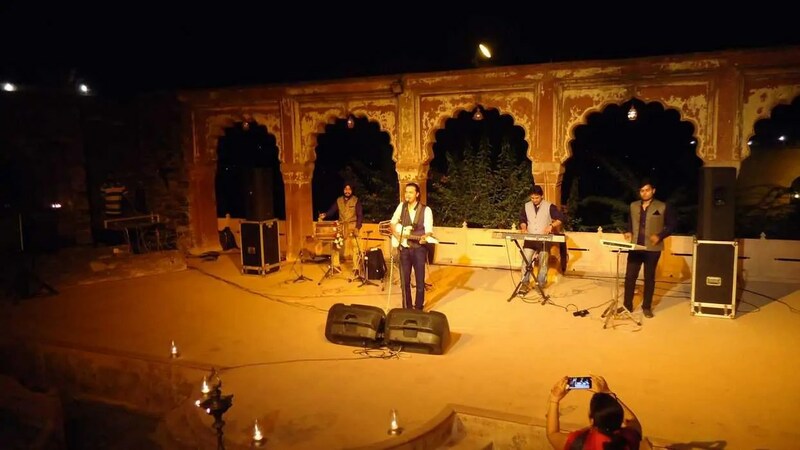 Even without checking the records, the Neemrana fort officials called us to the reception and said that we don’t have any booking and we have to check out. We showed them the booking printout that we had, only then they bothered to check the records and gave us an apology. We were very ill treated at that time, might be because they thought it was a check out and we were no longer their guest. We gave a written feedback about the incident, but it never reached the right place since we did not get any response. Another reason was because we complaint against the person managing the reception, check-in and check-out and he was the same person to collect the written feedback. So he, for sure, had not forwarded his complain to officials. This was the only incident that spoiled the mood for a while, but otherwise it was a royal retreat for sure, a wish come true. ← V Resorts Sattal: Perfect Offbeat Destination for Serenity Lovers. Tattapani: Hot water springs of Unexplored Shimla, having curative powers. Copyright © 2019 InertiaSpeaks. All rights reserved.